Do you have a great idea for cancer research? 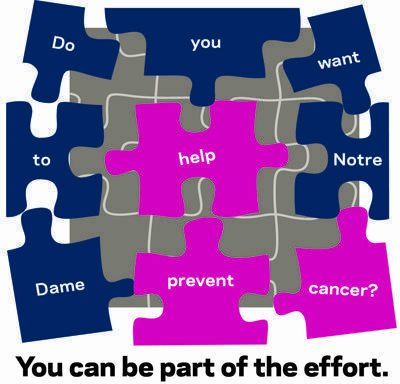 Do you want to help Notre Dame prevent cancer? You can help Notre Dame find the missing pieces to the puzzle. The College of Science and Harper Cancer Research Institute are sponsoring a new program called Research Like a Champion for students to drive innovation in cancer research. Individual Notre Dame students or groups of students who choose to work in a team (no more than three students per team) may apply. Both undergraduate and graduate students from all colleges are eligible to submit research proposals that look into the causes, treatment and prevention of cancer. Students must have a mentor, but this can range from a University faculty or staff person, to an outside corporate or physician mentor to oversee each project (Please contact Andrew Bullock, Ph.D. if you or your team needs help identifying a mentor.). An award of $12,500 will provide support throughout the academic year and summer. Funding can be used to support summer student stipends, research supplies, and travel. Innovative research proposals must be based on scientific research and breast cancer projects will have special consideration. Students will also be expected to present their projects at Harper Cancer Research Day. Deadline: Proposals must be submitted to Andrew Bullock by 5:00 p.m. on March 15, 2014. Help spread the word through your social networks using the hashtag #ResearchLikeAChampion. Please feel free to contact Andrew Bullock (Harper Cancer Institute) or Sean Kassen, Ph.D. (College of Science) with any questions. Originally published by Stephanie Healey at science.nd.edu on February 25, 2014.